What’s speedway? Think of it as flat track on steroids. These bikes have no brakes, no gears, minimal front suspension, no rear suspension, and methanol-burning engines. There’s one, raised footpeg on the right, because the left foot—protected with a steel shoe—hardly comes off the ground. These mercilessly fast, 500cc single-cylinder fire-breathers ride like “on-off” switches: twist it, go, and hope for the best. Moto Talbott has several Speedway bikes on display. Our 1978 Jawa was owned by the late Ole Anderson, a Swedish rider who lived not far from Moto Talbott. He was a member of the Swedish National Speedway team in the ‘50s. 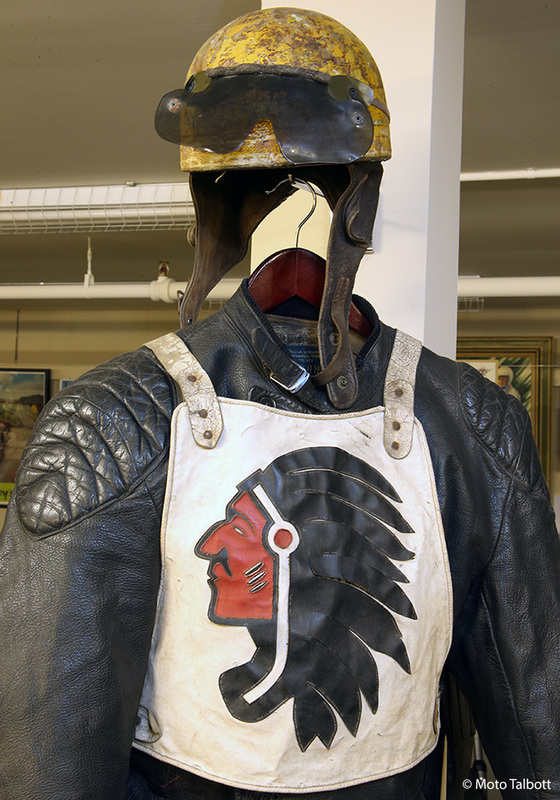 We also have his riding gear and boots from those days. 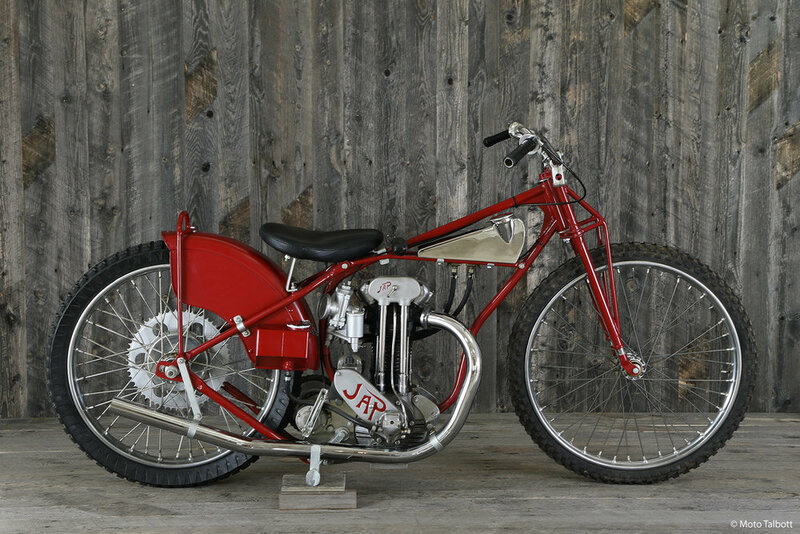 Our beautifully ragged, unrestored mid-1930s speedway bike has a 1935 Rudge chassis and JAP engine. The motor is a “long” five-bolt pre-war cylinder type with a Rudge clutch and transfer case. 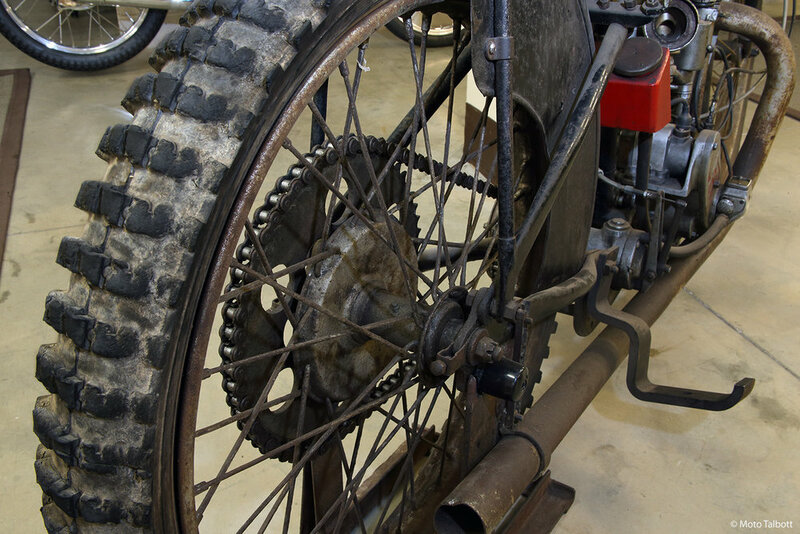 It has an original 28x2 ¾-inch race tire marked “Speedway Remould” with the address of the manufacture in London. It also has an Amal carb, Webb Dirt Track fork, and BTH magneto. We also have a beautiful 1948 JAP racer, from Britain.